[ Leadenhall Press publication, with ownership inscriptions of Charles Sarolea and J. Laurie Coulson. ] The dear Neighbours! By the Author of "John Bull and his Island" &c., &c.
vi + 268pp., 12mo. In sturdy red morocco half-binding, with brownish-black boards in ribbed patterned cloth, and gilt tooling, marbled endpapers. Binders' ticket at rear: 'Bound by Blackie and Son'. On browned high-acidity paper, with slight damage to title-leaf. On the front free endpaper is the ownership inscription of 'Chas Sarolea', i.e. Professor Charles Sarolea [ Charles Louis-Camille Sarolea ] (1870-1953), noted Belgian philologist and author who settled in Scotland. Facing this, on a flyleaf, is the ownership inscription of 'J. 19pp., foolscap 8vo. On ten leaves stapled together in one corner. In fair condition, on aged and worn paper with staining from staple. He introduces his subject as follows in the first paragraph: 'I regard it as a great honour to have been invited by Professor Lopez-Rey, on behalf of the Secretariat of the United Nations, to address the Second United Nations Congress on the Prevention of Crime and the Treatment of Offenders. The subject assigned to me is criminological and penological research, a fascinating but intricate theme. [Printed pamphlet.] Mémoire Descriptif d'un Brevet d'Invention pour une Machine Volante dénommé Avion Militaire de Grand Combat Vitanval en faveur de M. Leon Louis Laforge Prince Laforge de Vitanval. Second Partie. Traduit de l'Espagnol. ['Au Ministerio de Fomento a Madrid. Le 25 Mai 1916 sous le No. 62.342'.] Madrid: Artes Gráficas "Mateu". Paseo del Prado, 34. 1916. 4to, 22 pp. In original green printed wraps. Frontispiece photograph on art paper, inscribed in bottom right-hand corner 'A M. Maggs Bros booksellers | Souvenir de la guerre | Pce. Laforge de Vitanval | Madrid 12 Aout 16'. Text clear and complete. In fair condition, on lightly aged and worn paper. No diagrams. The invention is described as 'un Aéro-frein ou frein automatique pour aéroplanes et toutes espèce de machines volantes, empêchant le capotement des appareils, en cas d'accident ou d'arrêt subit du moteur'. Mimeographed and stapled. [i] + iii + 17 pp. Printed on eleven leaves, the first two and last two 26 x 21 cm, and the middle seven leaves 25.5 x 20 cm. Fair, on foxed paper with wear to extremities. It would appear that the leaves of the two articles had been printed previously, and were newly bound up here with the preliminary matter. 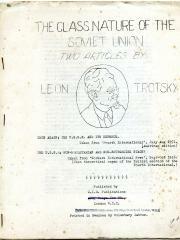 The first articles is, according to the title 'Taken from "Fourth International", July Aug 1951. 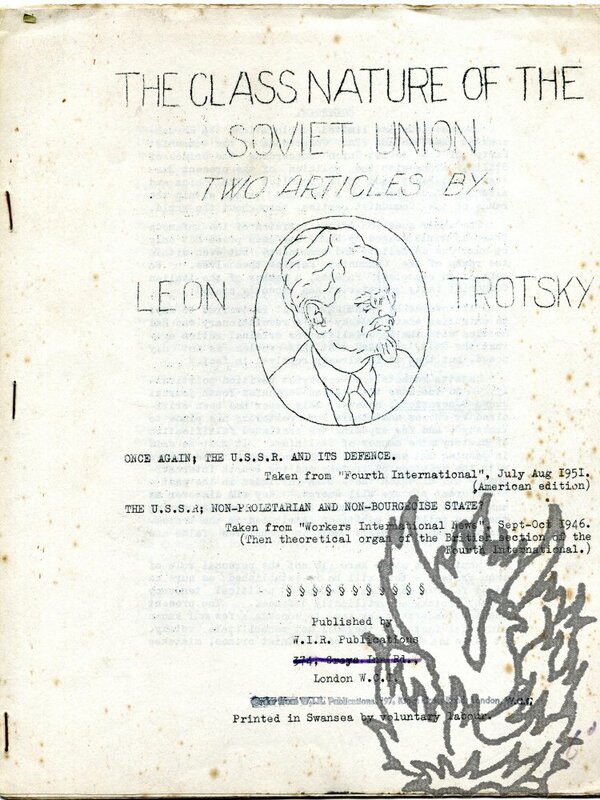 (American edition)' and the second 'Taken from "Workers International News", Sept-Oct 1946. Autograph Letter Signed ('Mischa-Léon'), in English, to 'M. Rosing' [Vladimir Rosing]. 8vo, 3 pp. Bifolium with dimensions of leaf 18.5 x 14 cm. Good, on slightly grubby and lightly creased paper. Small slip of paper mount adhering to one margin (not affecting text). Written in a bold and distinctive hand. He will not be able to make 'an appearance with "Lhada" [?]' as he is 'sorry to see that I am in Brighton the 22nd and 23rd of April, where I sing with Madame Donalda'. Autograph Note Signed ('E. de Jonquieres'), on visiting card, to 'Monsieur Lalanne, Conservateur de la Bibliothèque de l'Institut'. Written on both sides of the card, dimensions 5.5 x 9 cm. Good, with a little light scuffing on the front. Communication between two leading lights of French nineteenth-century mathematics. Printed text reads 'VICE-AMIRAL DE JONQUIERES | MEMBRE DE L'INSTITUT | AVENUE BUGEAUD, 2'. Asks Lalanne to 'inscrire Monsieur Bonnaffé, lauréat de l'Institut, parmi les lecteurs'. Autograph Letter Signed ('L. Lalanne') to 'Monsieur Sisson' ('Mon cher capitaine'). 9 February [no year]; no place. 12mo, 2 pp, 11 lines. Concerns the 'porteur de ce billet', a 'M. Laudet', who has been the victim of 'un affreux malentendu'. 'Le malheureux perdait sa femme au moment où il manquait une garde'. Autograph Letter Signed ('C. de Freycinet') to an unnamed male correspondent. 12mo, 1 p, 20 lines. On grey paper, good, with a line of light offsetting from another document on the blank reverse. He wanted to read the work he has been sent before writing to acknowledge its receipt. 'Je suis trop peu de chose pour qu'un compliment de moi vous soit sensible'. He awaits the reprint with impatience, and regrets not having received a copy sooner. As for the introduction, he does not see how it could be changed. 'Ce que vous y dites sera toujours vrai et est aussi nouveau qu'il y a 19 ans'. The form is what one would expect 'd'un littérateur'. Autograph Letter Signed to unnamed male correspondents. BBC. | Evesham. | Ware. | 18/3/42'.